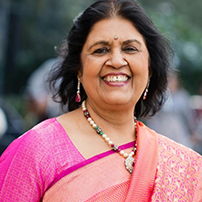 Usha Agarwala is an educationist and Ex-President of FICCI Ladies Organisation. She is actively engaged in the activities of the Sanathan Sangeet Sanskriti, an organisation that promotes ancient art and culture and We the Women, a endeavour for women empowerment through education. She is also involved with Aspirations India, a youth-oriented NGO.